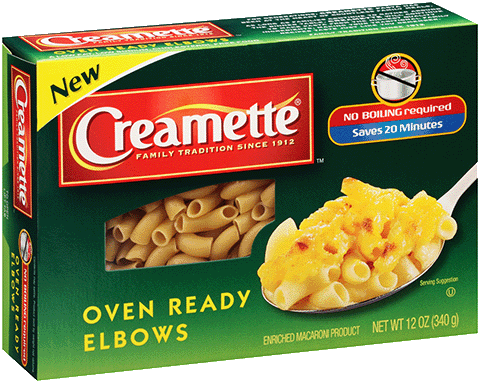 Bring your chunkiest, boldest sauce and favorite ingredients to life with Creamette® Thick and Hearty™ pasta. 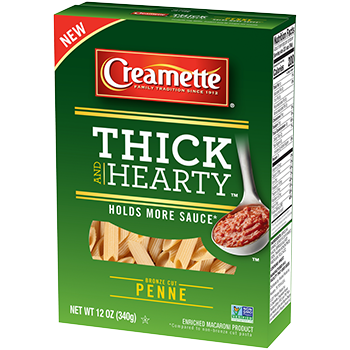 Our Thick and Hearty penne is thick cut with a bronze die, making it more satisfying*; it hugs your pasta sauce, instead of leaving it behind. Experience the ultimate bite! More flavor, more filling, and more satisfying. 1. Bring water to a BOIL. Add salt to taste. 2. ADD PASTA to boiling water. Cook uncovered, stirring occasionally. Cook for 13 to 15 minutes. 3. DRAIN well and serve as desired. MAINTAINING PERFECT PASTA: To keep cooked pasta fresh for later use, toss with a small amount of olive oil and refrigerate. * The % Daily Value tells you how much a nutrient in a serving of food contributes to a daily diet. 2000 calories a day is used for general nutrition advice.